Hyundai's woes mark a major reversal for the automaker which was an early success story in China as it quickly and cheaply rolled out popular new models into a surging market. SEOUL/DETROIT/CHONGQING, China -- At a near-empty Hyundai Motor Co. showroom in the Chinese mega city of Chongqing, the store manager is grumbling about his shortage of customers and a lack of bigger, cheaper SUV models popular in the world's largest auto market. Even with discounting of as much as 25 percent, his dealership was selling barely a hundred vehicles a month, said the manager surnamed Li. A nearby Nissan dealership was selling about 400 vehicles a month, a store manager there said. "The sales are simply poor," Li told Reuters. "Look at the Nissan store next door, they have tens of customers while we just have two." An hour's drive away is Hyundai's massive $1 billion manufacturing plant, which opened last year with a target to produce 300,000 vehicles per year. Hyundai, the world's 5th largest automaker, declined to comment on the Chongqing plant's production or the showroom's sales but said it is "closely cooperating" with local partner BAIC to turn around the China business. BAIC did not respond to requests for comment. In 2009, Hyundai and partner Kia's combined sales ranked third in China after General Motors and Volkswagen. Foreign rivals not only defended their turf in premium segments but also kept pricing competitive for mass-market models, squeezing Hyundai's positioning as an affordable foreign brand, they said. In the United States, the world's second-biggest auto market, Hyundai's market share fell to 4 percent last year, near a decade low. Japanese rivals such as Honda, long a role model for the Korean automaker, have also struggled to adapt to the industry's emerging challenges including self-driving cars and electric vehicles. Last month, Hyundai posted a 68 percent plunge in third-quarter net profit and reported its operating margin shrank to 2.7 percent in the January-September period. In 2011, Hyundai's operating margin of 10.3 percent was the industry's highest after Germany's BMW. Hyundai's lack of a strong crossover or SUV lineup in key markets has also hurt. Last year, crossovers accounted for just 36 percent of Hyundai's U.S. sales while crossovers and SUVs made up 76 percent of General Motors sales. Those vehicles made up 63 percent of the total U.S. market. "One of our challenges back then, and I know it would continue to be a challenge, was that the management at (headquarters) was really big on sedans," said Ed Kim, a Hyundai U.S. product manager between 2004-2008 who is now vice president for California-based auto consultancy Auto Pacific. "(U.S.) product planning staff, marketing staff really wanted more truck products, more SUVs, but in so many cases, it was very difficult to convince management." Hyundai America Chief Operating Officer Brian Smith acknowledged the automaker was "caught a little off guard" with a rapid market shift toward big vehicles. But a slew of new planned crossovers, including a crossover-based pickup truck in 2020 will help drive a “slow, steady” recovery in sales, Smith told Reuters in an interview. Asked if Hyundai will be able to return to its record market share of 5.1 percent in 2011, Smith said: “It’s going to take a few years." "I'll never forget it. They pulled the sheet off of it and there were 20 people in the room and not one person clapped," Florida-based Fink told Reuters. "Then, more than anything else, it just became a price war," Fink said. In 2007, the Sonata was 10 percent cheaper than Toyota's popular Camry sedan but by 2014 it cost more, according to U.S. market research firm Edmund.com. Hyundai, which sold nearly 200,000 Sonatas in the U.S. market in 2010, sold just 131,803 units last year. This year, Sonata's U.S. sales have fallen 23 percent to 88,240 vehicles through October. Back in the Chinese city of Chongqing, dealers at four Hyundai showrooms visited by Reuters say the new Encino crossover, based on its small South Korean Kona crossover and launched this year in China, missed the mark. "We don't sell Encino. 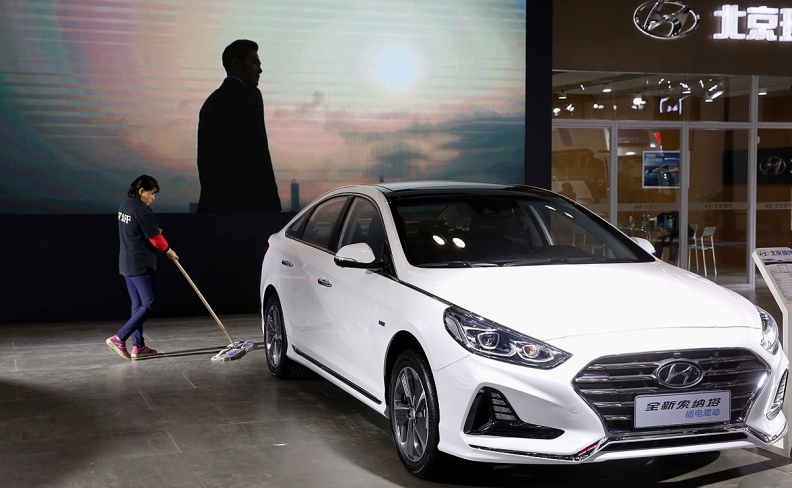 It simply doesn't fit the Chinese market," said another store manager surnamed Liu at one of Hyundai's first dealerships in Chongqing. "Most Chinese prefer bigger, cheaper and prettier cars." But the China recovery will likely be "gradual" given an economic slowdown and intensifying competition from rivals, Hyundai said in a statement to Reuters. Company officials, dealers and analysts expect the task of leading a revival will fall heavily on Hyundai's third generation leader, Euisun Chung. Chung, 48, was promoted to executive vice chairman in September, moving him a step closer to succeeding his octogenarian father and current chairman, Chung Mong-koo, who has been absent from public view and key internal meetings for the past two years. But Hyundai also invested less than rivals in r&d. Last year, Hyundai Motor spent just 2.6 percent of its revenue on r&d, compared with 6.7 percent for Volkswagen, 3.8 percent for Toyota and 3.6 percent for BYD, according to their annual reports. Euisun Chung has had some early setbacks. At the 2011 Detroit auto show, he unveiled Hyundai’s new brand vision -- modern premium -- to revamp its value for money image, and four years later announced the automaker's first premium brand, Genesis. Nick Reilly, a former chief executive of GM Korea, told Reuters that Hyundai's brand image has certainly gone up but still is "not anywhere near a premium brand". "So I think they have to go back to the mentality to be very price-competitive in order to maintain the volumes," he said.